Below we provide a short and detailed guide of how to roll over a 401k. But first lets talk about why you would want to do this. There are two primary benefits you get from rolling your 401k to an IRA, first is greater flexibility and second is greater transparency. With an IRA you get to choose which firm you want to open your account with, whether or not you want it professionally managed, and what investments go inside (house, stocks, bonds, funds, gold, etc.). You also gain transparency with an IRA. For instance, you can get a clear view of what fees you are being charged. 401k plans typically debit their fees directly from the performance of the funds and don’t usually offer any reporting on what the fees were. Ever see the stock market at all time highs and wonder why your 401k seems to be lagging, this is one of the main reasons. 1. Open the new account. The first thing you need is a new account to receive the funds from your old 401k. 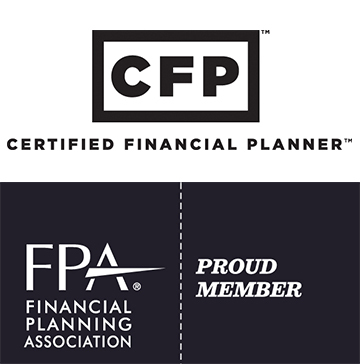 This means you need to decide if you are rolling the old 401k to a new company plan like a 401k or to an IRA. If it’s a new company plan like a 401k then you can get the account opened by working with your HR department. If its an IRA you need to open the account yourself or select an advisor to help you. You can generally open an IRA at any of the large brokerage companies, banks, credit unions etc. Note, each will have different investment options and fees. Lets say you changed jobs and your new company offers a 401k plan and you are not sure if you should roll the old 401k into the plan or to an IRA. Here are some Pros and Cons to consider: If you choose to roll it to the new 401k your investment options are limited to what is in that plan. You will also be paying the 401k fees which are not transparent but studies have shown the average cost is around 1.5%. As a rule of thumb the smaller the company plan the higher the fees. The good news: might impact the amount you can loan yourself from the account (50% of the account up to 50k). Also, some plans allow employees over the age of 55 who separate from service or incur a triggering event to take distributions penalty free. Otherwise, an IRA does generally offer better flexibility in many ways. More investment options (including alternatives like real estate), wide choice of firms, easier to hire professionals. IRA’s do offer a number of early withdrawal penalty (10%) exemptions like qualifying educational expenses (college tuition for your child) and a few others. Also, IRA’s are a good way to lower fees which can add up big over long time periods. If you like passive investing through low cost index funds the IRA might be for you.Those are some of the big things to consider when trying to decide between rolling to your new 401k vs a IRA. To start you will need to contact the company that holds your current 401k plan (call them). Tell them you want to do a direct rollover to your new IRA (or 401k). The direct rollover process means they will liquidate your investments, make the check out to your new account custodian, and mail it directly to them, not you. This will prevent them from withholding 20% of the distribution per IRS regs. What you need: the check instructions (who they should make the check out to). Mailing address (where they should send the check). You can get both from your new account custodian by calling them. If you don’t know which company holds your current 401k, you can usually find out by looking at an old account statement. If you don’t have one you can contact your former company and talk with someone from HR, they can provide you the name or a contact to work with. Once you have the name of the company get online and go to their website to find a customer service phone number you can call. It’s important to start this process by speaking with the current plan custodian because historically they each tend to have different requirements for processing the rollover. 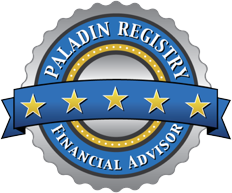 Also of note, there are now some brokerage companies (places you can open an IRA) that offer rollover processing and initiation directly within their website and your online account. In short, you enter some information about your old 401k and they offer to send paperwork requesting the rollover directly to your old 401k company. If it works this is a great service you should take advantage of, but don’t count on it 100% of the time. Often the 401k company will require the account owner to fill out and sign a form. Another important note: in 2015 the IRS imposed a rule that restricts regular IRA rollovers to one per 12 months. Their guidance on this issue says that direct rollovers such as those from a 401k or company plan to an IRA (with funds sent direct to the new retirement account) are not included in that rule. Thus, another reason to do a direct rollover as opposed to an indirect rollover – (one where the check is made out to you and mailed to you). If your rollover went into a new 401k plan then these funds will be invested automatically into the selections you made when you set up the plan (not much to do in this case). If your rollover went to an IRA: If you hired an advisor then they will work with you to invest the funds and build you a portfolio based on their work with you. If you are investing the funds on your own (say through a discount brokerage like Schwab) you can start making trades to invest the money once you see the check hit the account and funds available. If you opened an account with a robo advisor the funds should automatically get invested based on the questions you answered and information you provided when you opened the account. 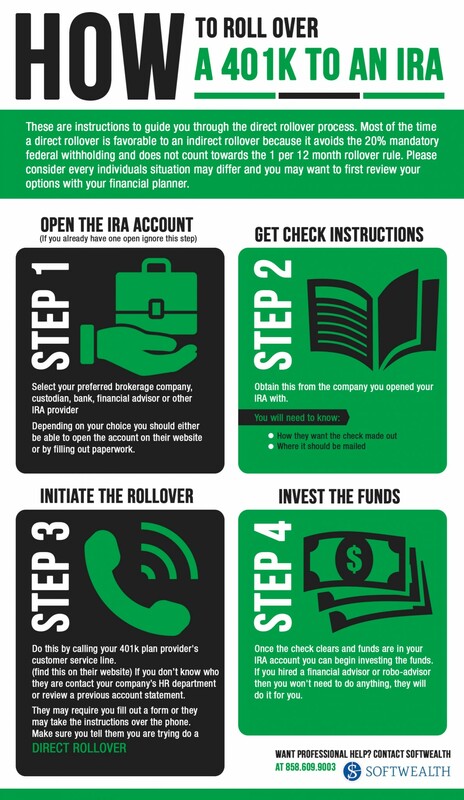 Check out our helpful 401k rollover info graphic here. As you can see, there are a number of considerations before making this decision. If you feel overwhelmed or need help you should consider hiring a professional. This article is intended for informational purposes only and generally speaks to rollover considerations for individuals who have not yet hit retirement age. There could be many other factors to consider based on a persons unique situation or for someone who is in their retirement years as defined by IRS guidelines.